I gave you fair warning yesterday that I'm obsessed with grilling. Add that to my obsession with asparagus, and it should come as no surprise that this is one of my favorite spring dinners. (As a side note, I really hope you aren't getting tired of asparagus recipes - I still have a few to share with you before it goes out of season)! I think the combination of the grilled veggies is just perfect, the bread is crispy and garlicky, the vinaigrette is simple but flavorful, and the garnishes add just the right amount of crunch and flavor. I especially loved the sprinkling of goat cheese on top. I have also updated my Featured Recipes page with some of my favorite vegetarian dinners ! Preheat the grill to medium-high and clean the grates. Brush the bread with oil and sprinkle with salt and pepper. Toss the asparagus, pepper, and onion lightly with oil and season with salt and pepper. Grill bread 1-2 minutes per side, until crisp and golden. Remove from grill and when cool enough to handle, rub with the cut garlic clove. Set aside. Grill asparagus, pepper, and onion until charred and cooked through turning once. Remove from grill and chop into bite-sized pieces. Dice the bread into cubes and toss with the grilled vegetables, tomatoes, olives, pine nuts, and basil. Toss with the vinaigrette (you may not need all of it -just add a little at a time until you're happy with the amount). Season with salt and pepper if necessary. Divide evenly among plates and sprinkle with goat cheese. Serve warm or at room temperature. No such thing as getting tired of asparagus! This sounds and looks amazing! Great salad. Oh my gosh. Cannot wait to make this. It looks fresh, healthy, and so colorful! 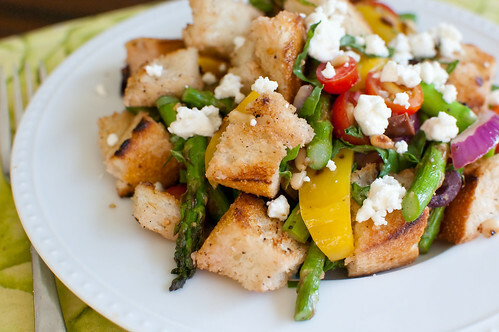 I love panzanella of any form (often make Greek as well as Caprese versions)...will have to try this next!